Concord, North Carolina (April 25, 2018) – Claiming trophies in two of the first three ARCA Racing Series presented by Menards events on the season, Venturini Motorsports (VMS) is back on the road looking to continue the team’s early success in Friday’s General Tire 200 at Talladega Superspeedway. Enjoying a recent resurgence, VMS, is off to its best season start in the organization’s storied history. Already with two victories and three General Tire Pole awards in the first three races of 2018, the team is stacked with talent and loaded with confidence. Beginning with the sweep in the season opener at Daytona, highlighted by Michael Self’s dramatic victory and Natalie Decker’s headline grabbing pole award, the team continues to hold the spotlight with the recent success of teenage drivers Christian Eckes and Chandler Smith. Eckes, 17 year old, made headlines last week winning his first career series event at Salem Speedway, while 15 year old Chandler Smith blasted onto the scene three weeks ago winning back-to-back pole awards and leading 178-laps during his first two attempts. With the attention shifting back to Talladega for the fourth stop on the series schedule, VMS brings a full house of drivers primed and ready to add their names to Talladega’s symbolic Hammer & Anvil Trophy. Previewing Dega’s General Tire 200, Daytona winner, Michael Self, returns to his familiar No.15 Sinclair Oil Toyota after a one race absence to make his first ever start on the behemoth 2.66-mile superspeedway. 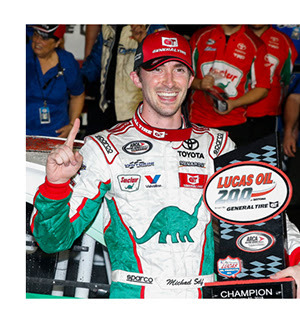 Self, who led the driver point standings after Nashville, has won two of his last three ARCA races. Kevin Reed, winning crew chief for both team victories, will reunite with Self and call the shots atop the pit box. 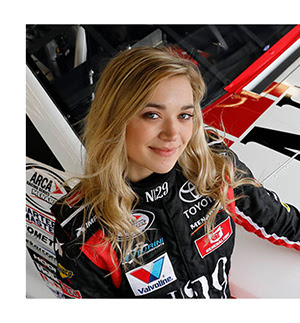 Quickly becoming one of the sports’ most identifiable up and coming driver personalities, 20 year old, Natalie Decker will strap back into her No.25 N29 Capital Partners – Yamaha Power Products Toyota at Talladega looking to rebound from her hard luck finish at Salem. With only one superspeedway race to her credit, Friday’s start will be Decker’s first at the famed Alabama track. Decker, occupying the fourth-spot in ARCA’s driver point standings, has taken the series by storm since signing with VMS last season. The Wisconsin native made history earlier in the year winning the pole and finishing a career best fifth at Daytona back in February. Possessing the foundation and savvy to succeed, Decker’s popularity shows no ceiling. Talladega beware! 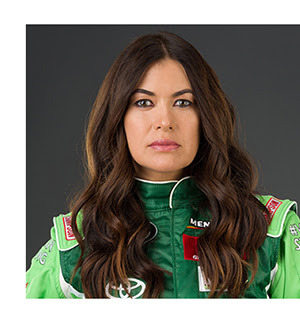 Joining Decker as the only other female driver on the entry list, Leilani Münter, makes her triumphed return to the series driving her No.20 VeganStrong.com Toyota. Münter, set to race in eight series events with VMS in 2018, had a career day with an 8th place finish and personal best fifth place qualifying effort at Daytona. Serving as her crew chief, Münter will be paired with 10-time ARCA Racing Series champion Frank Kimmel. Kimmel, with a series best 80 wins, including two at Talladega, is one of the most decorated racers in ARCA’s illustrious history. Brandon Lynn will make his first series start since announcing his two race deal with VMS earlier in the month. Lynn will make his team debut piloting the No.55 Remodeez Toyota Camry at Talladega. 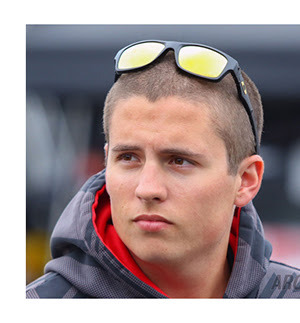 Lynn, a 23-year old native of Penn Yann, NY, has made eight series starts with two top-10 finishes since making his ARCA debut back in the Spring of 2015. In his last series start at Talladega in 2017, Lynn nearly won after driving from the back of the pack to lead the final 20-laps of the race before running out of gas as the race was forced into overtime after taking the white flag. Looking for redemption, Lynn hopes to add his name to a list of first time winners driving with VMS. Lynn’s second and only other scheduled race with Venturini Motorsports will come next month in the running of the General Tire 150 at Charlotte Motor Speedway. Practice for Friday’s General Tire 200 takes place same day from 8:30 to 10:20 a.m. General Tire Pole Qualifying (group format) follows at 2:30 p.m. The General Tire 200 is scheduled to get the green flag shortly after 5:00 p.m. Friday afternoon. All times local, central time. The General Tire 200 at Talladega is live on FS1. All on-track activities will be featured on live timing and scoring at arcaracing.com, plus live chat.